Spoiler season is brewing season, and this one has me deliriously joyful. Last week, some enticing cards from Shadows over Innistrad inspired me to revisit and introduce an old brew of mine: Wx Tallowisp. 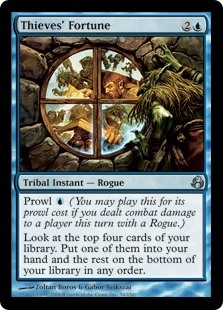 I also alluded to another of my longstanding projects, a UGx Rogue tribal deck. Exactly zero commenters inquired about that pile, but I’ve been having too much fun tuning it this week not to share anyway. This article describes the deck’s origins, considers its evolutions, and updates the deck with some Shadows tech. I remember casually watching Pro Tour Fate Reforged to see where the format landed in the wake of the Treasure Cruise banning. I had the stream running as I got dressed to head to a Modern tournament myself. On my way out, I got to see the beginning of a match between Makahito Mihara and Lee Shi Tian in which the pair passed a Humble Defector back and forth. Defector had some really cute interactions with the Splinter Twin deck. Pestermite can untap Defector in response to its ability for a net of four cards. While legal, Splinter Twin could enchant Defector to cast Divination each turn. We now know the creature never saw serious play in Twin, but these synergies still intrigued me. Fast-forward to a few days later. I’m perusing Gatherer for secret cantrips when I discover Thieves’ Fortune. I read it and my jaw drops. A one-mana Impulse? If the Modern card pool has any decent Rogues, this card could actually serve as a reliable consistency engine. And what’s this… it’s a tribal instant?! Guess we have to include Tarmogoyf. Bummer! When I brew, I usually start with an idea and follow it to its logical extreme until I end up with a deck. If the deck seems like a worse version of an existing deck, I try to tweak it so it does something better than that deck. If I can manage that feat, I start running it through the Tier 1 gauntlet to check if it can hang with the big boys. At this phase in the Rogue deck’s lifespan, all I had was an idea: find a shell that allowed me to play Thieves’ Fortune and Tarmogoyf together. Step one: check Modern for Rogues. 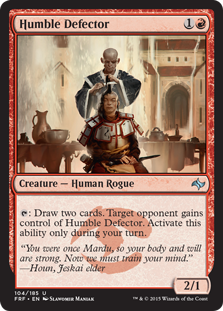 By now, you’ve guessed that Humble Defector is a Rogue. So is Pestermite. This was all welcome news to me, and I came up with a Temur Twin shell that included the combo. I also wanted Spellskite and Snapcaster Mage in some number, and figured it would be wrong not to include Aether Vial. Vial economizes mana and simplifies setting up the Defector-Pestermite interaction. Flashing in Spellskites and Goyfs sounded pretty fun, too. Remember Shouta Yasooka’s Eternal Command deck? Minus the Witnesses, that’s my kind of party. After a few matches, I compared this deck to Temur Twin. No space for mainboard Remands made it difficult to interact with spell-based combo decks like Ad Nauseam – I had to race those or die. No space for flexible one-offs made me wonder why I wanted Thieves’ Fortune at all. Just to find my combo? In some matchups, I didn’t even want the combo. And in those matchups, I missed Electrolyze. I boarded Fortune out more than any other card, and it would sometimes rot in hand when I lacked cheap Rogues to set off prowl. Or when Humble Defector couldn’t even look at the red zone because of my opponent’s Tarmogoyf. Maybe I was asking too much of the little guy. I mean, he’s just a humble 2/1. Don’t build a worse version of an existing deck. I built a worse Temur Twin. Maintain focus. I built a deck around Thieves’ Fortune that ran better without Thieves’ Fortune. So, I guess I needed to focus less on Pestermite. But the other Rogues were so… bad. I figured this was why nobody played Thieves’ Fortune in Modern, and benched the project indefinitely. Indefinitely ended when Wizards banned Splinter Twin. The announcement got me thinking. The Rogue deck gets better with Splinter Twin. With Splinter Twin, the Rogue deck is a worse Splinter Twin than Splinter Twin. Without Splinter Twin, the deck gets even worse. But if nobody can play Splinter Twin, at least Rogues isn’t a bad Splinter Twin deck anymore. Good enough for me. Exactly one exciting card had been released for this deck since Pro Tour Fate Reforged: Faerie Miscreant. Despite her clearly underwhelming effect, Miscreant was still a flying Rogue one-drop, and therefore supported Thieves’ Fortune. I had so many Faeries now it felt wrong not to include Spellstutter Sprite. And given Fortune’s increased reliability, I tossed a Kiki-Jiki, Mirror Breaker into the mix. I also ran a set of Noble Hierarch to complement Vial and maximize speedy starts. Exalted on a Faerie was my big breakthrough with this version. The first draft I tested played quite badly, like most of the Kiki-Mite decks that chased the January 18th announcement. I dropped the deck as I began testing Eldrazi Stompy, an unrefined version of the deck that destroyed Modern. Last week’s Shadows review included a blurb on , a card I’m beginning to think will redefine the format. We all know what happened last time I made this claim, so I won’t argue with detractors – you’re right, we’ll see in due time! That said, the card is testing so well for me I can’t help but extol its virtues. Traverse buffs creature decks that can quickly and reliably put four card types into their graveyards. Specifically, Traverse grants unparalleled Modern consistency and a hyper-efficient toolbox element to decks that want to play Tarmogoyf. That includes most of Modern’s goodstuff decks, and excludes established creature decks like CoCo and Hatebears. Just how valuable is consistency? Ponder and Preordain are banned in Modern for the consistency they provide. And toolboxing? Birthing Pod in Modern went the way of Survival of the Fittest in Legacy. Even in this desolate Eldrazi winter, Modern’s premier toolbox deck – Abzan Company, formerly known as “Podless Pod” – took down GP Detroit. Traverse’s “hidden mode” is Lay of the Land, which helps us build a manabase in the early game, and lets us play less lands and more card types. This mode makes Traverse as good as a “real” cantrip, since those are played for their ability to find lands early and business later. With its eight Bolts, this deck has trouble losing to linear aggro decks like Affinity, Burn, and Infect. Tarmogoyf also gets big enough here to seriously clock anybody racing on a non-combat axis. Aside from that, Bolt-Snap-Bolt has always been the bee’s knees in this format, and having access to cards like Huntmaster, Sower, and Scavenging Ooze at opportune moments gives this deck huge all-around game. fills a role here similar to Green Sun’s Zenith‘s in Josh Utter-Leyton’s original Counter-Cat. After we’ve achieved delirium, a trivial feat in Modern, Traverse increases our board presence mightily by adding a Tarmogoyf, or finds the answer to a question posed by our opponent. Notably, Traverse doesn’t have to search green creatures, which gives it a serious leg-up over Zenith – we can find Magus of the Moon against greedy opponents, Glen Elendra Archmage against combo decks, and Snapcaster Mage to close out the game with a final Lightning Bolt. The main reason to play a Temur Traverse deck in Modern, besides its high density of power cards, is its ability to search a bullet Moon effect. Most decks in Modern lose to an early Blood Moon, and many others lose to a late one. Others still can fetch around Moon reliably enough to deter players from boarding in the enchantment against them. These include most blue Counterspell decks, and a host of green creature decks. All of them sometimes open draws that encourage them to fetch a lot of shocklands. Being able to search for and resolve a Blood Moon effect on command gives Temur Traverse a tremendous advantage over multicolored decks, since we can easily punish these openings on sight. With just one Magus main, we never clog on Moon effects. When opponents sculpt a Moon-proof manabase, a naturally-drawn Magus at least provides a 2/2 body. Temur Toolbox showed promise in testing, but felt kind of boring to me – I’m not big on “stabilizing.” I only played with it for a few days before trying Traverse in the more aggressive Rogue deck, and I haven’t looked back since. Faerie Miscreant: Enables early Fortunes, which do a great job of turning on delirium. Also becomes a real threat with Noble Hierarch or . 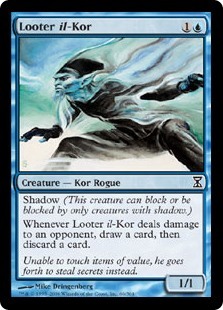 Looter il-Kor: Another easy enabler for Fortune, and by now, everyone knows the strength of constant looting. Looter cycles through lands like nobody’s business, and also fills the graveyard for delirium. It’s not uncommon to resolve a Looter on turn two, attack, dump a missing card type, and immediately be able to Traverse into a bullet. He can’t block, but makes up with the best evasive mechanic in Modern. 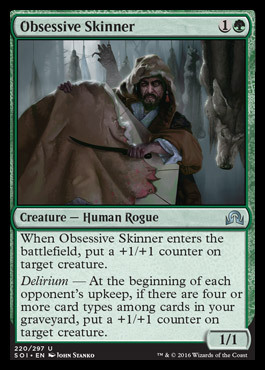 : The deck’s eighth Rogue, Skinner makes the cut as a searchable way to overcome board stalls. He also grows Miscreant and Looter to silly proportions for evasive assaults, and combos with persist creatures from the sideboard. Noble Hierarch: Accelerates into high-velocity plays, turns our Rogues into clocks, and lets Goyf attack through his defected brethren. Oath of Nissa: A cantrip that adds to delirium in multiples and Ponders into relevant creatures. Oath combines with Visions and Hierarch to facilitate keeping one-land hands. Spell Pierce: Allows us to switch gears for games two and three and become highly reactive. Since this deck pressures opponents so quickly and spends so much mana cantripping, Pierce is our preferred Negate effect. Tremendous with Snapcaster Mage. Ancient Grudge: Affinity hate that efficiently splash-damages anyone relying on artifact synergies. : Our best answer to Pyroclasm and Anger of the Gods, which can dismantle our boards. Tarmogoyf also helps on this front, but I like having a hard answer to sweepers and board wipes in the sideboard. Surgery also hits all-stars like Lingering Souls, Serum Visions, Scapeshift, and Living End, and its extraction effect can prove deadly for combo decks. Izzet Staticaster: A searchable death sentence for dork-based creature decks, Infect, Affinity, and others. Thrun, the Last Troll: Most blue decks just don’t beat this card. Thrun attacks like a ton of bricks and is impossible to kill. Wrath of God? Meet . Glen Elendra Archmage: Two Negates on a searchable body. Even more Negates with Skinner online. Sower of Temptation: Interactive opponents often spend a hefty chunk of resources dealing with our board if we pace threats correctly, and Sower aims to come down when they put all their eggs into the proverbial Tasigur basket. Stormbreath Dragon: Not a lot beats this Dragon. Modern’s interactive decks simply cannot remove it. With Dismember‘s reign of terror ending in April, Stormbreath seems like a great option to terrorize fair opponents. 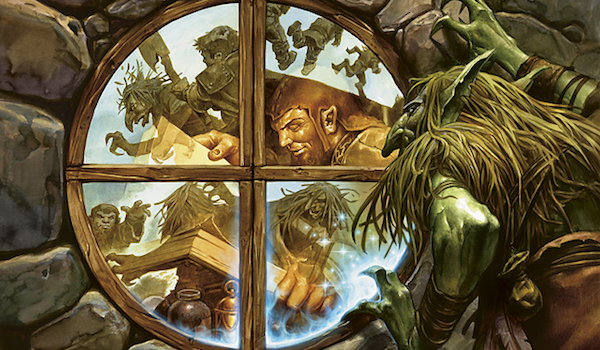 Temur Rogues has tested swimmingly so far, and the toolbox element makes it highly adaptable. More than anything, the success I’m having with Temur Rogues suggests that is insane in Modern. The question remains whether Temur Rogues is a worse Temur Toolbox. When we compare my lists, we see that Temur Rogues trades away Thought Scours, some burn spells, and a slightly expanded mainboard toolbox for a more aggressive plan, improved consistency, and higher velocity. Is that trade worth it? Testing will tell. Concerning specific matchups, Temur Rogues performs well against creature-based linear decks and poorly against spell-based linear decks. Access to bullets like Huntmaster of the Fells, Magus of the Moon, and Snapcaster Mage makes the creature matchup easy – we have so much relevant interaction at our fingertips. Not true for decks like Ad Nauseam, Burn, and Storm, which all demand cards like Spell Pierce and from the sideboard. I like Ancient Grudge as an extra hedge against Affinity, a deck I hope I’ll never forget to respect. Interactive decks are simpler for us to handle, since we have such an impressive arsenal of interactive cards at our disposal. Stormbreath, Thrun, Sower, and Huntmaster all devastate certain interactive decks. The hardest to beat are those with targeted discard and cheap removal, since they can break up our Rogue synergies and deal with Tarmogoyf at parity. Traverse still frequently out-grinds these Abrupt Decay decks; Izzet Staticaster chews through Confidants and Lingering Souls tokens, and Magus turns off manlands. I originally ran a Keranos in the sideboard, but cut it because it proved unnecessary for these matchups. I also tried the Kiki-Mite package, first in the main and then in the side, before trading it for actual answers to my problems. Regardless whether Temur Rogues remains my Traverse deck of choice, I believe the card will usher in a new breed of goodstuff toolbox decks in Modern. I imagine Temur will remain the best color combination, thanks to blue’s ease in achieving delirium, Snapcaster Mage’s synergy with , and the immense relevance of a bullet Moon effect. Either way, we’ve got a lot of brewing to do, and I couldn’t be more motivated. Shifting gears, if only a tiny bit: here’s to hoping the last Shadows over Innistrad spoilers give us a “fixed” Tarmogoyf! I really like the Oath of Nissa + Traverse the Ulvenwald idea, but I’m not sold to the rogue shell. Faerie Miscreant, Looter il-Kor and Obsessive Skinner don’t seems that great by themself. Maybe with Things in the ice, Spell Pierce main deck, Thought Scour and 4x Snapcaster Mage? Sounds like my Temur Toolbox list, above. Thing in the Ice is way worse than Tarmogoyf here, we’d rather have bullets or just search out more Goyfs for raw power. I’m also not sold on the Rogues yet, but I think this list is the best the tribe can do for now. Time to buy some cards! Traverse the ulvenwald seems awesome. I’d love to see maybe some sort of hatebears/D&T deck abuse it. Find the right bear vs the right deck! Delirum seem hard to achieve in those deck though. 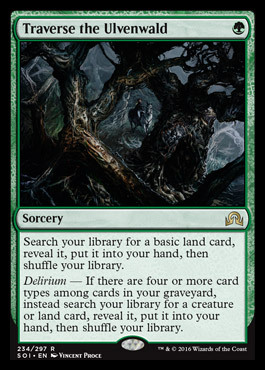 Anyways delirium is a huge incentive to play goyf, so i’ll probably not play traverse in the near future but i love the card! Those decks don’t even play Goyf because they can’t fill graveyards reliably. The decks set to get the most from Traverse are spell-based aggro decks in GRx and GBx. The goodstuff decks can still splash the bear bullets themselves – it’s not hard for Abzan to run a single Gaddock Tegg or Thalia, for instance. Or that sweet, sweet Anafenza the Foremost. Thanks for reminding me that Delerium enablers like Tarfire and Seal of Fire exist for Jund. Makes Traverse seem like a sweet option. I agree that a deck that could harness thieves fortune would be sick; I too have seen that card in tethered and wondered what if…my first thoughts were bitterblossom, silhana ledgewalker or invisible stalker. Caleb Durward made an assault bogles brew a while back that was rg and looked like a fun, semi competitive deck; adding blue could be a consideration. Does shardless agent look better now that ancestral vision is legal?